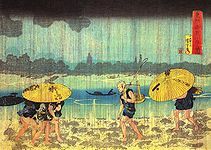 Utagawa Kuniyoshi (歌川 國芳, January 1, 1798 – April 14, 1861) was one of the last great masters of the Japanese ukiyo-e style of woodblock prints and painting. He was a member of the Utagawa school. The range of Kuniyoshi's subjects included many genres: landscapes, beautiful women, Kabuki actors, cats, and mythical animals. He is known for depictions of the battles of legendary samurai heroes. His artwork incorporated aspects of Western representation in landscape painting and caricature. He continued to produce warrior prints, drawing much of his subjects from war tales such as Tale of the Heike (Heike monogatari) and The rise and fall of the Minamoto and the Taira (Genpei Seisuiki). His warrior prints were unique in that they depicted legendary popular figures with an added stress on dreams, ghostly apparitions, omens, and superhuman feats. This subject matter is instilled in his works The ghost of Taira no Tomomori at Daimotsu bay (Taira Tomomori borei no zu) and the 1839 triptych The Gōjō bridge (Gōjō no bashi no zu), where he manages to invoke an effective sense of action intensity in his depiction of the combat between Yoshitsune and Benkei. These new thematic styles satisfied the public’s interest in the ghastly, exciting, and bizarre that was growing during the time. The Tenpō Reforms of 1841–1843 aimed to alleviate economic crisis by controlling public displays of luxury and wealth, and the illustration of courtesans and actors in ukiyō-e was officially banned at that time. This may have had some influence on Kuniyoshi's production of caricature prints or comic pictures (giga), which were used to disguise actual actors and courtesans. Many of these symbolically and humorously criticized the shogunate (such as the 1843 design showing Minamoto no Yorimitsu asleep, haunted by the Earth Spider and his demons) and became popular among the politically dissatisfied public. Timothy Clark, curator of Japanese art at the British Museum, asserts that the repressive conventions of the day produced unintended consequences. The government-created limitations became a kind of artistic challenge which actually encouraged Kuniyoshi’s creative resourcefulness by forcing him to find ways to veil criticism of the shogunate allegorically. During the decade leading up to the reforms, Kuniyoshi also produced landscape prints (fūkeiga), which were outside the bounds of censorship and catered to the rising popularity of personal travel in late Edo Japan. Notable among these were Famous products of the provinces (Sankai meisan zukushi, c. 1828–30)—where he incorporated Western shading and perspective and pigments—and Famous views of the Eastern capital in the early 1830s, which was certainly influenced by Hokusai's early-1830s Thirty-six Views of Mount Fuji (Fugaku sanjūrokkei). Kuniyoshi also produced during this time works of purely natural subject matter, notably of animals, birds and fish that mimicked traditional Japanese and Chinese painting. In the late 1840s, Kuniyoshi began again to illustrate actor prints, this time evading censorship (or simply evoking creativity) through childish, cartoon-like portraits of famous kabuki actors, the most notable being "Scribbling on the storehouse wall" (Nitakaragurakabe no mudagaki). Here he creatively used elementary, childlike script sloppily written in kana under the actor faces. Reflecting his love for felines, Kuniyoshi also began to use cats in the place of humans in kabuki and satirical prints. He is also known during this time to have experimented with wide composition, magnifying visual elements in the image for a dramatic, exaggerated effect (ex. Masakado's daughter the princess Takiyasha, at the old Soma palace). In 1856 Kuniyoshi suffered from palsy, which caused him much difficulty in moving his limbs. It is said that his works from this point onward were noticeably weaker in the use of line and overall vitality. Before his death in 1861, Kuniyoshi was able to witness the opening of the port city of Yokohama to foreigners, and in 1860 produced two works depicting Westerners in the city (Yokohama-e, ex. View of Honchō and The pleasure quarters, Yokohama). He died at the age of 63 in April 1861 in his home in Genyadana. Kuniyoshi was an excellent teacher and had numerous pupils who continued his branch of the Utagawa school. Among the most notable were Yoshitoshi, Yoshitora, Yoshiiku, Yoshikazu, Yoshitsuya, and Yoshifuji. Typically his students began an apprenticeship in which they worked primarily on musha-e in a style similar to that of their master. As they became established as independent artists, many went on to develop highly innovative styles of their own. His most important student was Yoshitoshi, who is now regarded as the "last master" of the Japanese woodblock print. Among those influenced by Kuniyoshi was Toyohara Chikanobu. Takashi Murakami credits the pioneering influence of Kuniyoshi affecting his work. See The Kuniyoshi Project for a more extensive list. Kuniyoshi's work may be parsed thematically, as in this group of images which feature cats. Caricatures were among Kuniyoshi's themes. ^ a b Lubow, Arthur. "Everything But the Robots: A Kuniyoshi Retrospective Reveals the Roots of Manga," New York Magazine. March 7, 2010. ^ Johnson, Ken. "Epics and Erotica From a Grandfather of Anime", New York Times. April 15, 2010. ^ "Yōshū Chikanobu [obituary]," Miyako Shimbun, No. 8847, October 2, 1912. p. 195. ^ Kitagawa, Hiroshi et al. (1975). The Tale of the Heike, pp. 511-513. Klompmakers, Inge, “Kuniyoshi’s Tattooed Heroes of the Suikoden”, Andon, No. 87, 2009, pp. 18–26. 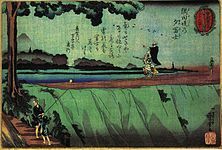 Wikimedia Commons has media related to Utagawa Kuniyoshi. Ukiyo-e Caricatures 1842-1905 Database of the Department of East Asian Studies of the University of Vienna. Over 400 prints of Kuniyoshi are included. Graphic Heroes, Magic Monsters Gallery exhibition at New York's Japan Society featuring Kuniyoshi prints.